1990 Beans (South Africa). Needs pinto beans. Q ln ity: 117 metric tons. SA. Cable: LEWSAK. Phone: Pietersburg 6528. Hypotheken-Und Wechselbank, Muenchen 70. Contact: Herrn Erwin A.
Muenchen 70, West Germany. Telex: 05/216 882 PREXD. Phone: 089/7603041. industrial raw materials. Would like to deal directly with manufacturers. New Germany, Natal 3620, South Africa. Cable: APECO, New Germany. 1997 fat and non-fat powdered milk, stabilizers, emulsifiers and flavours. Buyer requests catalogs and offers CIF Alexandria from U.S. manufacturers. Street, Bab El Louk, Cairo, Egypt. Caole: Scientific Cairo, Egypt. specializes in food products and already represents two American firms. Sylvie Martin, Soreau S.A., 62 Rue Moliere, Ivry Sur Seine 94200, France. City, California 94017. Telex: 470372 WWCP UI. Phone: (415) 467-9656. 48 x 410 gr. cans. Powdered milk: 24 x 500 gr. cans or 241 x 500 gr. (C) 65% protein or over. Packaging: (C) polylined in 50 kg bags. Selma Place, P.O. Box 99, Weston CreeK, A.C.T., Canberra City, Australia. Telex: HAIDER A62995. Phone: 883268. UBA Ltd Kano, Savannah Bank Kano. Contact: T. J. Frederick, P.S. Liverpool, U.K. Attn: D. A. Porter or Mr. F. Rickman. Telex: 629112 UK. immediately 2,000-2,500 mt. clack beans for delivery at Guatemala port. Requests sale conditions as soon as possible. 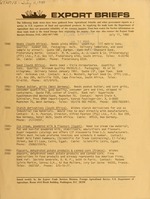 Telex: GU-4136. Giant. Quantity: 3,000/4,000 head. Quality: pure-bred 4/5 months old. Consumers Road, Suite 603, Willowdale, Ontario M2J 4V8, Canada. Phone: (416) 498-9221. Telex: 06 966 897. 2020 Broilers (Greece). Needs broilers, frozen. Quantity: 200 mt monthly. start immediately. Separate quotations for USDA Grades A & 8 requested. Greece. Telex: 214941. Cable: ASLANCO ATHENS. Phone: 9585767. 2021 Cnicken meat (Netherlands). Desires cooked, boneless chicken meat. Quantity: container loads 60-80 mt per year. Requirements: only E.C. ref: Rabo-Bank, Eerde-Veghel. Contact: N. J. H. Ploegmakers, Geor. Abalone. Quality Grade A. Packaging: canned size: 1 flat No. 10. Kowloon, Hong Kong. Telex: 84020 LAMSO HX. Phone: 3-743-2011/8. Lagos, Nigeria. Telex: 21608. Phone: 962236.
soybean oil a month. Quality fully refined and deodorized. F. F. A.
max. 0.1%, iodine value 130-15G. Moisture and volatile matter 0/02%. Kano, Savannan Bank Kano. Contact: T. J. Frederick, P.S. Mandrides & Co.
Ltd., John Holt & Co. (Liverpool) Ltd, 380 India Bldgs., Liverpool, U.K.
Bilbao (Vizcaya), Spain. Telex: 32600. Phone: (944) 424 83 00.
best yield. Delivery as soon as possible. Quote CIF and FOB to Greeceg ..
Bank ref: National Westminster Bank Ltd., Walm Lane, London NW2. Wl, England. Telex: 24224, REF: 3859. Phone: 01-637'8802. 2034 Broilers (Canary Islands). Wants frozen broilers. Quantity: 100-200 W::t.
de Tenerife, Canary Islands. Delivery immediately. Bank ref: Vizcaya. Palmas de Gran Canaria, Spain. Telex: 95209 RIESS E.
Phone: (928) 36 67 46.
meat. Quantity to be determined. Delivery September. Quote FOB or CIF. P.O. Box 1914, 16100 Genova, Italy. Telex: 270060 SIG. Pennacchiont. 2036- Meat extracts and sodium glutamate (Switzerland). Agency representation . and 200 mt annually. Quotations, packaging, delivery to be discussed "
63138 INTL CH. Phone: 061 332626.
the scene of the International Flower and Horticultural Show, October :. D.C. 20037. Phone: (202) 244-3745.